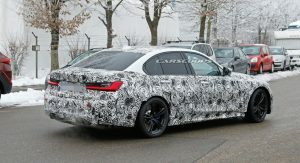 The 2020 BMW M3 is expected to debut at the Frankfurt Motor Show this fall and now we’re getting a better look at the high-performance model. 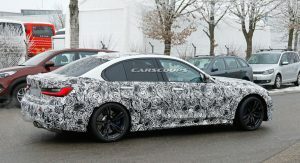 Caught wearing less camouflage than previous prototypes, this model does its best to hide the M3’s aggressive styling. 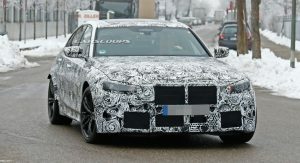 BMW’s effort is pretty successful at the front as the prototype has ‘fake’ headlights and a heavily disguised bumper. 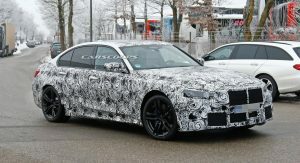 While there isn’t much to see, the front of the car will likely follow in the footsteps of the M340i. 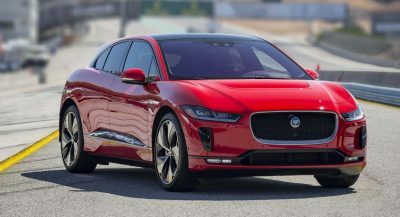 More details are visible further back as prototype rides on a set of lightweight wheels which are backed up by a high-performance braking system with blue calipers and drilled discs. 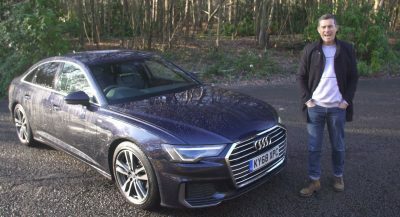 We can also see aerodynamic side skirts, Shadowline trim and extended fender flares which hint at the car’s wider track. 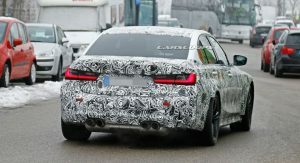 The rear of the car is still heavily disguised, but this M3 sports production taillights and a four-tailpipe exhaust system. 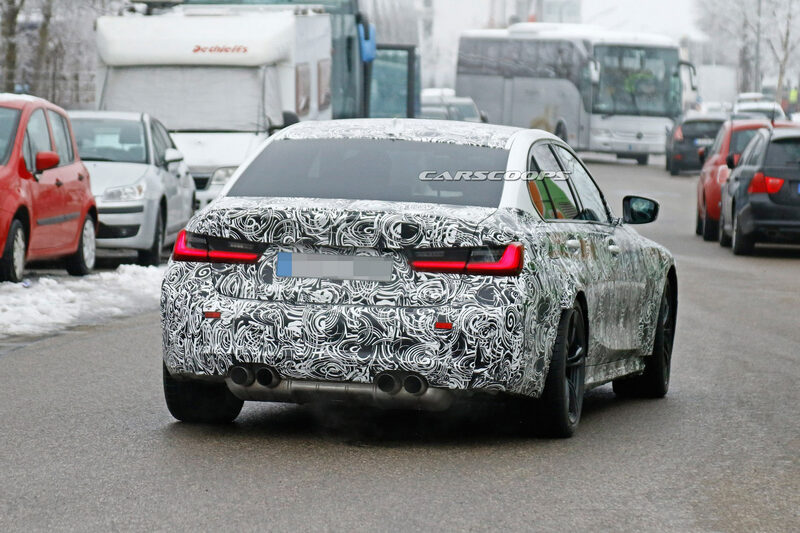 We can also expect a more aggressive bumper, but the camouflage does a pretty good job of hiding styling details. 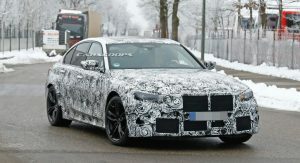 We still haven’t gotten a good glimpse of the interior, but the cabin should largely carryover from the 3-Series. As a result, drivers can expect a 12.3-inch digital instrument cluster and a 10.25-inch infotainment system. There should also be an M steering wheel as well as unique trim and upholstery combinations. 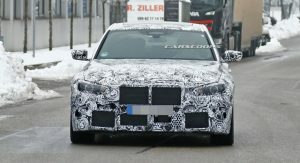 BMW has been tight-lipped about the model, but the car is expected to have a new twin-turbo 3.0-liter six-cylinder engine that develops around 474 hp (353 kW / 480 PS) and 480 lb-ft (650 Nm) of torque. 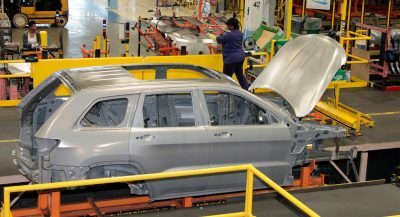 It will reportedly be paired to an eight-speed automatic transmission and a defeatable all-wheel drive system. 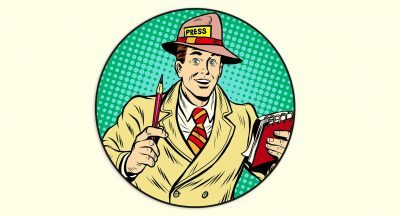 Fans looking to shift their own gears will reportedly have to wait for a so-called Pure variant. 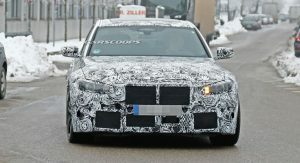 The model is rumored to have a six-speed manual transmission, rear-wheel drive and a slightly lower output of 454 hp (338 kW / 460 PS). 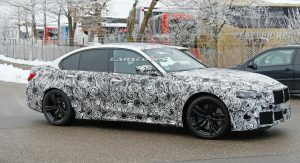 If previous reports are correct, the enthusiast focused M3 Pure will have unique bumpers, special wheels and an optional paint color that is exclusive to the model. 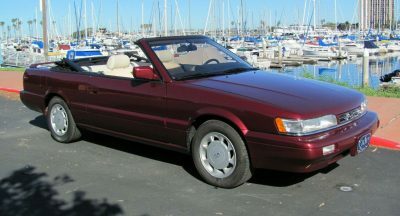 There could also be unique upholstery and a revised instrument cluster with special graphics. And the f80 and f82. They have the whole front from the 4 series (M4) on the 3 series (M3). Why bother with camo? Looks like every other 3 series the preceded it since 1995.